Ingredients: 2 pkgs. (5 tsps.) dry yeast//2 cups whole milk, heated to warm (105-115f or 40-46c)//1/4 cup honey//2 large eggs//6 cups whole wheat flour//2 tsps. sea salt//2 Tbl. ground flax seeds//6 Tbl. unsalted butter, softened. 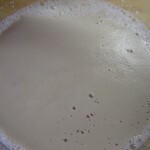 In a large bowl, dissolve the yeast in milk and let stand until foamy, about 5 minutes. The milk has to be at the right temperature, if it’s too hot the yeast will die, if it’s too cold the yeast will not grow. You’ll need some kind of kitchen thermometer for accuracy. Using a wooden spoon, stir in the honey and eggs. Add the flour, salt and butter and mix well until it all incorporated and forms a ball. Lightly flour a work surface, take dough out of bowl, place on surface and knead. This is the fun part! 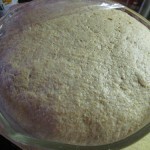 Work it baby, knead until the dough is smooth and elastic, adding just enough flour to keep the dough from sticking. This should take you about 5 minutes. Transfer the dough to a lightly oiled glass or ceramic bowl. I don’t use metal as it conducts heat and you don’t want the dough to get too warm or it won’t rise. Cover the bowl with plastic wrap and a kitchen towel and place in a warm place (on top of stove or radiator) until it doubles in size, about 1 1/2 hours. 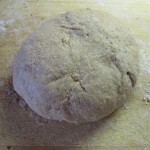 Take the dough out of the bowl, place on floured work surface, cut in half and knead each half for a few minutes. 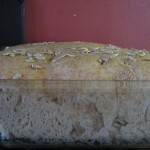 Form into 2 oval loaves and place seam side down in 2 oiled bread pans. 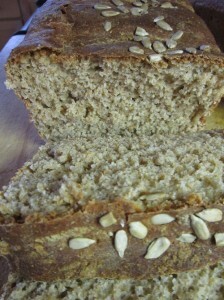 Sprinkle with sesame or sunflower seeds. Cover with towels and let rise in warm place for about 45 minutes or until dough is a little above top of pan. Bake in centre of oven for 35-40 minutes. Let cool on wire rack, slice and eat warm. Yum!